SOME of you might have noticed a little inconsistency in our photo of Clear Creek Beagles Master and huntsman Buck Wiseman’s coat. We posted the photo yesterday to show off Buck’s CCB hunt buttons, and it wasn’t until I downloaded the picture to post it on the blog that I noticed it, too: not all of those hunt buttons are for the CCB. The top one, also featuring a rabbit like the CCB buttons, has the initials R. F. B., a little difference that made me smile. Who knew Buck might have a slightly sentimental streak? Well, okay, Buck–we’ll call it “an appreciation of history,” if you prefer! The RFB button at the top and the Clear Creek Beagles pack share a nice history. The Rollington Foot Beagles were a revival of E.B. Merry’s Merry Beagles from Gates Mills, Ohio. Mrs. Merry had a nice pack, but in the mid 1970’s, she was getting older. She sold the pack en masse to a purchaser who promised to keep them going. 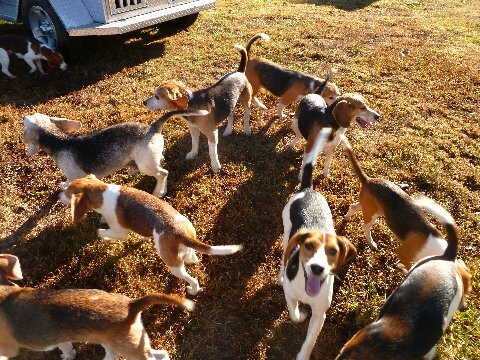 He didn’t, and by 1979, the pack had dwindled to about 5 couples who were disbursed around with various breeders not connected to the National Beagle Club. Mrs. Merry called the purchaser one day and essentially told him that she might have sold him the pack, but, damn it, it was still her pack, and she wanted it to be a pack. The purchaser agreed to collect the remnants and sell them on, and I, who had just expressed a wish to have my own hounds again, got the call from Jack Oelsner, the then NBC President to see if I wanted them. I did, threw kennels together in about three days and picked them up. Mrs. Merry did not want them to be called the Merry going forward as she felt that I had to give them their own identity. I did, with her permission, adopt her blue and green colors. At that time, we lived on Rollington Road near the Rollington community in Oldham County. I remembered that John Cowperthwaite in New Jersey had had a pack called the Readington Foot Beagles, which I thought was a name which scanned well, so the pack became the Rollington Foot Beagles. They were hunted as a purely private pack, mostly hunting the south end of Oldham County while the Fincastle Beagles hunted the north, until 1984 when I began to take a few subscriptions. In 1987, Patrick Rodes, son of Jack and Ruby Rodes, the then Fincastle Masters along with Kennedy Clark, was moving to Texas. Patrick had been hunting the FIncastle, and there was no obvious choice of a new huntsman. I suggested that the two packs amalgamate as there was a great overlap in the followers anyway, and we had frequent joint meets. 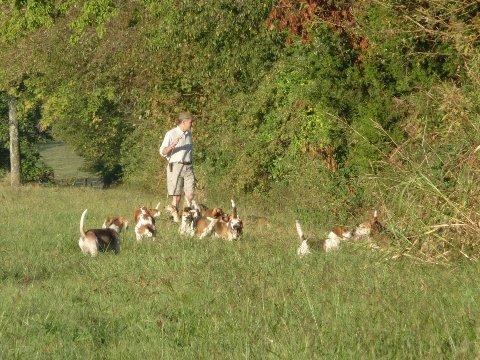 The Fincastle had been founded in 1902 as Clear Creek Beagles. Rather than have a double barreled name, we elected to revive the Clear Creek name and pick up the old Merry blue collar, a nice compromise, and away we went. For the record, I love the name Merry Beagles. It suits pretty much every beagle I know. The beagles on a less formal outing--and still very merry! Photographer Samantha Beckett took this marvelous photograph of an Exmoor hound at the hunt's opening meet in England. 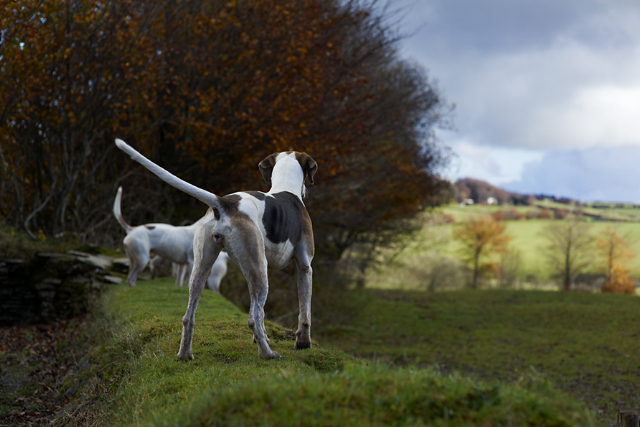 The Exmoor hounds cross some of the world's most beautiful country. 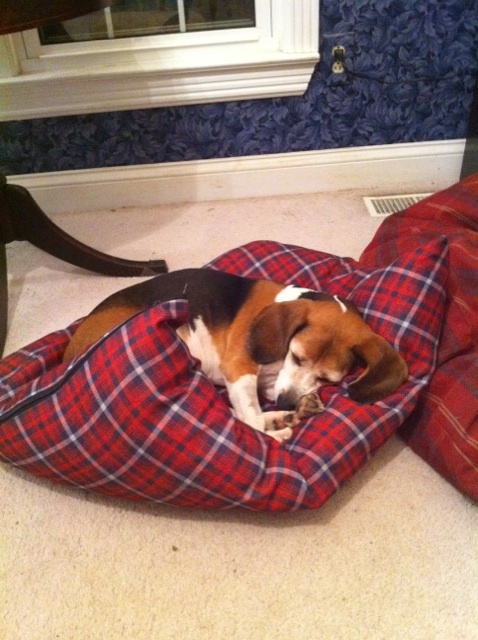 THE houndbloggers had a busy Thanksgiving holiday, did you? 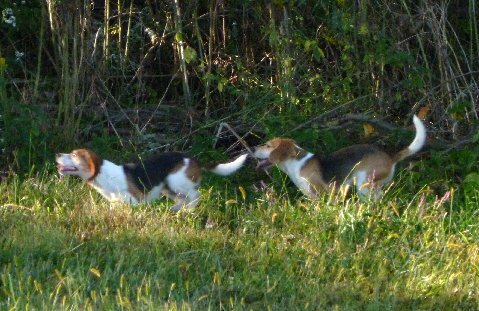 The highlight of our weekend came on Black Friday, or what Clear Creek Beagles whipper-in (and second in command) Jean MacLean has dubbed “Thanksgiving Boxing Day.” The houndbloggers avoided the crowds at the shopping mall and took to the fields instead with the Clear Creek hounds. It turned out to be a day of excellent sport, with several rabbits viewed (including one caught clearly on video!) and tenacious hound work by the beagles, who puzzled out the lines despite windy, sunny conditions. And just listen to that cry! We got several dramatic runs, and a couple of those are on the video above. The Clear Creek Beagles aren’t the only hounds that have their own videos. Recently we’ve found some nice videos and images from Exmoor in England, and we thought we’d share them with you while we wait for an end to local deer season and our return to the hunt field with the Iroquois hounds next week. Nic Barker and her friend Samantha Beckett, a photographer, have been providing beautiful photographs and high-definition videos at Nic’s blog from Rockley Farm. The blog entry with Sam’s photographs from the Exmoor hounds’ opening meet is here, and to see the Exmoor’s opening day video, click here. Good huntsmen talk about “the Golden Thread” of communication they have with their pack of hounds in the hunting field. I have, I believe, been blessed by something very real and of that sort with each of the individual hounds I have had the privilege of stewarding in their retirements. They each in their own particular way have found a particular place inside of me, a feeling as unique to each as their markings and their voice. I have known them each, intimately, by ways of knowing that come about not unlike the things of truth or faith or hope. To read the rest of the tribute to Quasimodo, click here. We hope you had a Happy Thanksgiving (and that you didn’t forget to share some of that turkey with your own hounds!). Iroquois huntsman Lilla Mason and the hounds during the 2010 Blessing of the Hounds. Photo by Dave Traxler. 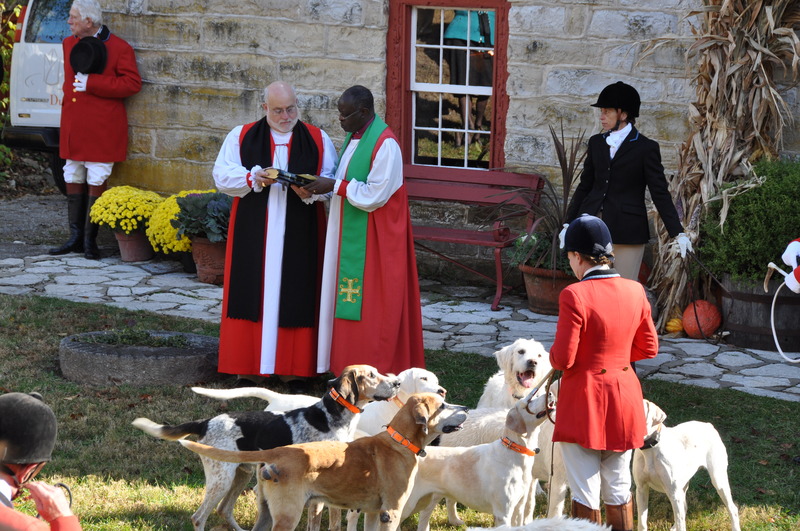 the Iroquois Hunt’s annual Blessing of the Hounds on Nov. 7 was as beautiful as always, maybe even a little more than usual, because the weather was cool after a frost and that meant … scent! The pack promptly took advantage of the bit of moisture frost provided and took the field on a good run after the blessing ceremony. But the houndbloggers know that what you really want to see are pictures! We don’t blame you. Our neighbor Dave took most of the ones in the Smilebox slide show below as he followed the proceedings from breakfast at the Grimes Mill to the blessing itself to the post-blessing stirrup cup and on to the hunt. You’ll see some familiar faces in the crowd, and not just human ones. 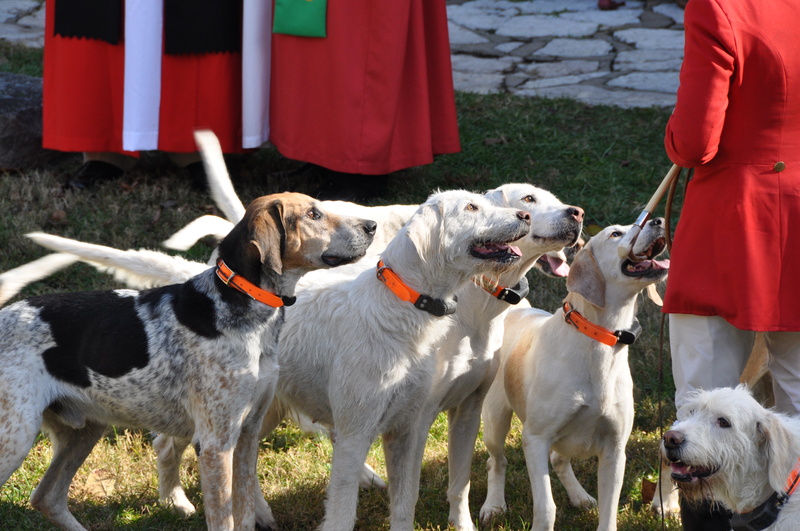 The group of hounds who represent the larger pack at the blessing each year includes some of our working hounds, like the giant woolly Sassoon, as well as some of our retirees. The retirees particularly seem to enjoy attending the blessing ceremony, possibly, we assume, because it allows them to go back to the retired pack at the kennel and sit reminiscing over their hunting days of yore. As you look at the hounds in the blessing photos, you’ll see a lot of bright eyes and happy, proud faces. Please help us continue to provide our noble retirees with the peaceful, dignified Golden Years they deserve by making a donation today to the Hound Welfare Fund. Your donations are tax-deductible, and 100 percent of your donation goes directly to the retired hounds’ veterinary care.